If you have not heard about this, you probably will by this weekend. The busiest freeway in the United States, the 405 freeway, is scheduled to close this weekend for a road widening project. 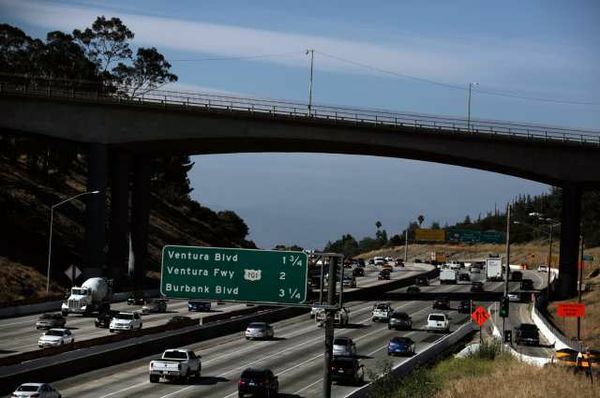 In order to make the freeway wider to accommodate more traffic, construction crews are going to tear down the Mulholland Drive bridge over the course of 53 hours, starting from Friday night, to 5:00 AM Monday morning. This freeway normally handles over 300,000 cars every day. This disruption to the normally hectic L.A. traffic has stirred this city into a frenzy. Only the brief visit by British royalty was able to interrupt the nonstop frenzy of talking heads predicting apocalyptic doom that is about to descend on the City of Angels. You may not know the geography of L.A. Let me give you a quick tutorial. To the north is the San Fernando Valley which is a large bedroom community of almost two million people. To the south, on the other side of the Santa Monica Mountains, is the Westside. This is where many of the major businesses are located. Here you have the L.A. International Airport, the beaches, the fancy malls, the financial companies, the high end restaurants, the movie studios. These two places are connected by one major freeway, the 405. Of note is that there are two major hospitals that sit right alongside the 405. These are the UCLA Medical Center and the Wadsworth VA Medical Center. But really all hospitals in the Westside are going to be affected. There have been some consternation about how this freeway closure will prevent emergency medical access for patients and if the hospitals can even be staffed adequately during that long weekend. Granted there are small roads that traverse over the mountain range, but these are expected to be completely jammed and overwhelmed over the weekend so that is not recommended. Our hospital has been sending out regular email asking people to trade calls with others who may have difficulty getting to work. Staffers are being asked to leave early Friday afternoon and it will be permissible to come back to work late on Monday. Some people are even anticipating staying over and not going home this weekend. My goodness, all this hysteria over a road closure. Imagine what will happen when the Big One finally hits Los Angeles and thousands of people are expected to perish or be seriously injured. Massive damage to infrastructure is predicted when an 8.0 or greater earthquake rocks Southern California in the future. That is truly an image of the armageddon that I hope never to see. If this single freeway being predictably closed over one weekend period can cause such paroxysms, God help us when a real disaster strikes.